YS Falls opened in 1990. It is a nature-based attraction offering the opportunity to experience the beauty of the waterfalls surrounded by lush gardens and magnificent trees. Located in located in St. Elizabeth, Jamaica. There are seven waterfalls, several which cascade into natural pools. Some areas are fairly rocky and do not allow swimming. Lifeguards on site, indicate which areas are for swimming, however, being able to swim is a requirement. There is a natural pool, fed by underground and above ground springs, which is more suitable for children and others unable to swim. More recent additions to the attractions at YS Falls, include exhiliarating canopy rides, which glide from the top of the falls to its base, and river tubing. These adventures are accompanied by experienced guides to take care of you along the way. There are bathrooms at the ticket office, where tickets are purchased in order to board the tractor and jitney for the 10 minute journey to the waterfalls compound. Here at the ticket office, there is an eatery (grill-style) and a bar and gift shop (stocked with local crafts). At the waterfalls, there are changing rooms and an environmentally friendly toilet (compost). There are many underground springs feeding local water supplies, so all efforts are made to protect these underground water supplies. For younger children, there is a playground. NOTE: Rainy months are May and October and at this time the river generally comes down in spate and swimming may be suspended. 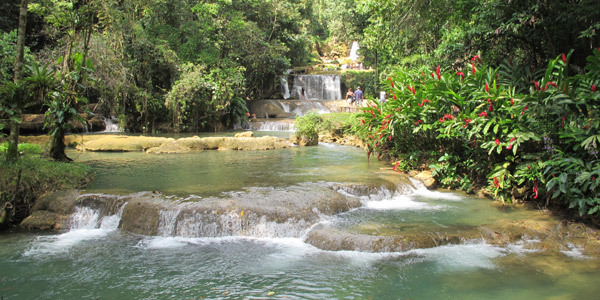 Nestled within a secluded valley on the less traveled South Coast of Jamaica, YS Falls is located on a working cattle and horse farm - YS Estate. Calmly coexisting in a carefully managed ecosystem 50 miles East of Negril and 50 miles South West of Montego Bay, YS Estate is situated in the "breadbasket" Parish of St. Elizabeth.